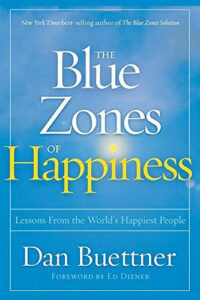 National Geographic journalist Dan Buettner discusses his book, The Blue Zones of Happiness. With 15 years at National Geographic, journalist Dan Buettner developed an unusual expertise in finding the most extraordinary populations on earth, then doing a bit of reverse-engineering to figure out what made them so special. His work led him to explore the secrets of happiness, which scientists measure in terms of life satisfaction. His new book, The Blue Zones of Happiness: Lessons From the World’s Happiest People, offers a blueprint for what makes life more fulfilling, less stressful and just plain better. He recently joined the Knowledge@Wharton show, which airs on SiriusXM channel 111, to share some of his insights. Following are key points from the conversation. There’s a “queer genesis” to happiness, Buettner said. It doesn’t just evolve on its own, and the best place to start is at the macro level. Nations need an established history of economic stability and security. A sense of equality and trust, particularly in government institutions, is also a necessary ingredient for happiness, he noted. “My central argument when it comes to happiness is that if you try to get happier, it’s a recipe for neurosis. That usually doesn’t work. But you can set up your environment so you’re more likely to be happy,” he said. The workplace is an example. Finding a work buddy, making overtures to others and having meaningful conversations are some ways to increase job satisfaction, regardless of whether you like your position or your pay. In his research, Buettner found three specific places that seem to be the happiest on earth. They are the Cartago province of Costa Rica, Denmark and Singapore. In Costa Rica, the climate is spring-like all year long and some of the world’s best coffee grows in the verdant central valley. There’s no army, and every citizen gets a free health check-up from a nurse practitioner every year. Costa Rica also has the highest literacy rate in Latin America. Denmark routinely tops the list of happiest place on Earth. In fact, that phrase is listed on the country’s official website. Danes get free health care for life, free college tuition, 10 months of paid maternity leave and a guaranteed retirement. These generous social programs allow citizens to ponder a higher sense of purpose. Life in Singapore is far more structured but just as satisfying, Buettner said. It’s a place where the path to success is neatly laid out. Financial security, a sense of pride and strong family ties are at the end of the long road. If you’re living in an unhappy place, move. The average American moves 9.8 times in his or her adult life, according to the U.S. Census Bureau. If that’s not enough motivation to move, consider a study by economist John Helliwell on the well-being of immigrants to Canada. After one year in their new home, the immigrants he followed reported greater levels of happiness. Buettner created the Blue Zones Project with a team of 200 people working in 23 American cities to help make them happier places to live. The project drills down into quality-of-life issues at the local level. That means working with city leaders to help craft policies that build better communities. “Places like San Luis Obispo, California; Boulder, Colorado; Portland, Oregon. In all these places at a certain point, enlightened leaders turned away from just more development. They turned the economic energy inward to build a vibrant downtown. They’ve done things like eliminate billboards. When you think about it, nobody likes billboards except the advertiser. We don’t need to be taunted to buy stuff we don’t need and eat food that isn’t all that good for us,” he said. Happy places are highly correlated with healthy food, walkability and lower rates of obesity. The best ideas rise to the top, and a team member sticks around to help implement them. There is a missing word in this discussion: consensus. In Costa Rica, Denmark and Singapore, there is a broad social consensus about how people should behave. While in Singapore this consensus is to an extent imposed from on high, all three countries have small homogeneous populations where such a consensus can develop naturally. Nevertheless, in any population there are people with different inborn behavioral proclivities, and some of these people will not fit comfortably into the socially accepted norm. Just as gay people stayed in the closet when homosexuality was widely frowned upon, so these people must hide their natural proclivities. Thus, there is a hidden dark side to the paradises Mr. Buettner describes. One other thing – achieving this degree of social consensus in the US is farfetched to say the least, so we in the US must find another route to happiness. Very much agree with Eric Klieber’s comment. I live in Boulder, CO and it is one of the most homogenous populations in the U.S. There is very little population diversity and God-forbid if you don’t subscribe or consent to a progressive mindset. Although, its a great place to live if you can afford it. Definitely a one-percenter town. Very Aptly Put. Happiness is the True Barometer for Life’s Measurements. The conventional progressive catch phrase – there is strength in diversity – may be true but Mr. Beuttner’s research also demonstrates that there is very little happiness in it. His three happiest places have little to no diversity and are homogeneous in cultural expectations.